The definition of uneven. There's great footage of offbeat Sydney locations and biker action around the city ranging from large parades to fiercely competitive street races shot in effectively adrenaline-inducing style. By contrast, almost every line is delivered like an absolute clanger, particularly from the lips of virtually all of the actors playing bikers. 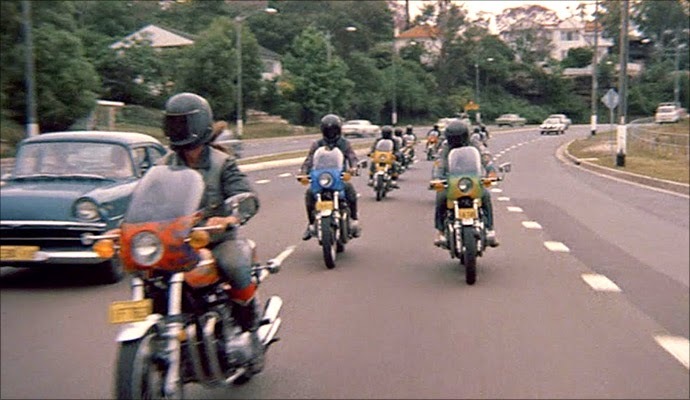 As a narrative, the film starts out well enough, with a stereotypical 1970s political killing/head trip scene followed by a lean sequence in which bikers who may have witnessed the killing are picked off one by one. The snappy rhythm quickly dissipates, however, and the rest of the film is an uneasy blend of languid observation and exploitation thrills with very little convincing connective tissue -- the undercover cop who works with the bikers seems to do virtually nothing of actual investigatory value, but he does have a good time on his Kawasaki.